I got a few questions on tumblr about the patterns and decided to go through Mccalls pattern and look for gyaru-able patterns because the last post only had pictures but no description on where to find them. Most of them were from burdastyle but the problem is, that these were only from their German homepage. When typing the number of the pattern into the enlish burdastyle, they didn't show anything. Therefore I decided to browse through Mccall's patterns and present some gyaru-ish or gyaru inspired pattern. Never forget, the fabric, lace, pearls and details make them gyaruish :)! All three are super cute. Imagine them in a white fluffy fabric with lace, and pearls on the colllar. I expecially like the last one, number C.
The first pattern is a uper cute and easy lace pants. Super easy, super quick skirts. Add more frills, lace, fake roses etc and they'll be perfect. If you don't like them to be that wide or flowing, take away a few cm off your pattern. 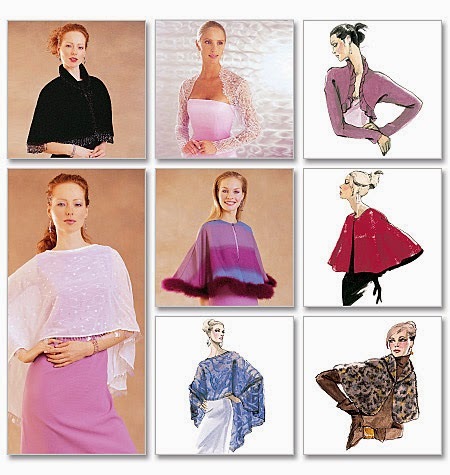 If you don't like the sleeves, reduce the armhole and the width of the sleeve pattern. But the peter pan collar with ribbon is just too cute. Bootwraps! Make them out of fake fur! A wrap, bolero and other cute ideas to keep you warm. I especially like the ones in the top.